Running backs aren’t nearly as valuable in modern NFL offenses, but the Seattle Seahawks are still clinging to Vince Lombardi’s NFL rather than embracing today’s pass-happy league. No team runs the football more than the Seahawks, and that’s far from hyperbole. When the score differential has been at seven points or fewer this season, Seattle has run the football on 44.5 percent of its offensive plays – a league-high through Week 11. As such, the collective ability of running backs Chris Carson and Rashaad Penny to play above expectation is much more critical to the success of the Seahawks’ offense compared to other offenses in the NFL. And fortunately for Seattle, both backs have done just that in recent weeks. Carson has prevented the team’s first-round investment in Penny from pushing him out of the fold in Seattle, as the second-year seventh-round pick currently leads the team in carries (128) and rushing yards (580) through 11 weeks. And he’s done so by picking up more yards than what’s been blocked for him this season. Among the 38 NFL running backs with 80-plus carries this season, Carson ranks seventh in rushing grade at 79.0. He also ranked tied for ninth in forced missed tackles per rush (0.20) and tied for second in yards after contact per rush (3.5) among the same group of backs. Furthermore, Carson has averaged a whopping 3.4 yards after contact per rush when contacted at or behind the line of scrimmage, which stands as the fourth-highest mark among qualifying backs. He’s also been tackled on first contact on just 60.4 percent of his carries, the second-lowest percentage among NFL backs through Week 11. And Penny is finally following suit after undeservedly earning the bust label in his first six games in the big leagues. In Weeks 10 & 11, Penny has totaled 154 yards across 20 carries, and 120 of his rushing yards (77.9%) have come after contact. He’s averaged 6.0 yards after contact per attempt and has forced four missed tackles in the two-week span, as well. Yes, Penny did pick up 33 of his yards after contact on one run against the Green Bay Packers on Thursday, but the play provided his critics with a much-needed sample of what he brings to the table and was quite impressive, nonetheless. Two games is still too small of a sample size to start bowing at Penny’s feet, but his 72.8 rushing grade is still a mighty step in the right direction. 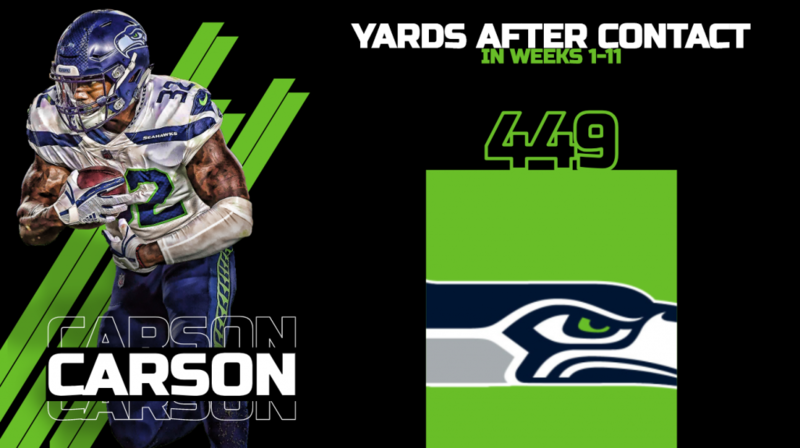 But if he can build on recent performances and continue to complement his high-performing teammate, Carson, Seattle may just be able to impose their will and establish the run their way into a playoff berth at the end of the season.